Massage is a practice with a long history of providing a wide range of health benefits, from pain relief to improved circulation to accelerated healing. However, when massage chairs were first developed, they were thought primarily to be designed for facilitating rest and relaxation. While they certainly deliver on that objective, they can do much more. One of the reasons that massage chairs do more than help you relax is that the best massage chairs today are much improved over older models. In the early days, massage chairs were very simple and had limited functionality. In many cases they could only provide pressure in a few areas and with only the most basic of movement patterns. Consequently, they can have a significant effect on your health. Reduced pain. Regular use of a massage chair can help decrease pain in many areas of the body. One where massage is especially effective is the lower back. As muscles that have become overly tight for any number of reasons begin to relax, lower back pain tends to decrease. In fact, for many people, massage may be more effective in reducing lower back pain than measures like acupuncture or medication. While you need to follow your doctor’s orders, of course, massage chair sessions may be a valuable addition to your treatment plan. Fewer headaches. Headaches in general and migraines in particular can have a muscle tension component. By reducing or eliminating that muscle tension, the best massage chairs may help to decrease the frequency and intensity of headaches. Faster workout recovery. When you exercise vigorously, your muscles produce lactic acid. This workout byproduct contributes to muscle fatigue and soreness. Gradually, your body processes lactic acid and removes it from your muscles. As athletic trainers and athletes alike will attest, regular use of an advanced massage chair can assist your body in eliminating lactic acid and help you recover from workouts more fully and more quickly. Lower blood pressure and heart rate. The stress of our hectic schedules often manifests as muscle tension in many areas of the body, most notably the neck and shoulders. That tension can then amplify the response of what is called the sympathetic nervous system (SNS), elevating your blood pressure and your heart rate. High blood pressure (also referred to as hypertension) increases the risk of many conditions including heart disease, stroke, and damage to organs like the kidneys. Massage produces a very helpful and healthy counterpoint to daily stress. It triggers your parasympathetic nervous system (PNS), which exists to moderate the effects of the SNS. In other words, the best massage chairs help bring your body back into balance and contribute to healthier blood pressure and heart rate levels. Improved immune system function. When your body is stressed, your immune system may be suppressed, making you more vulnerable to disease. By helping you relax, massage empowers your immune system to work more effectively. So while massage itself doesn’t prevent illness, it can help create the conditions in which your body can better defend itself. Our understanding of how the mind affects the body and vice versa continues to expand. We now know that many mental and emotional conditions have a physiological component as well. For example, while the exact mechanism is not yet understood, there is growing evidence that high levels of cortisol can contribute to psychiatric conditions. By helping to reduce stress and bring the body back into balance, massage may reduce mood swings as well as the symptoms of anxiety and depression. The best massage chairs have certain features that enable them to deliver exceptional health benefits. For example, they produce the appropriate amount of rejuvenating pressure from head-to-toe. The Brio Massage Chair is an excellent example. Its L-Track Massage Technology allows it to reach areas of the body that can be missed by other massage chairs. Advanced massage chairs also have a variety of predefined “routines” to choose from. This allows you to select a pattern that addresses your particular needs today, and a different pattern if appropriate tomorrow. Plus, they let you manually combine different massages. This gives you the flexibility to customize a routine, which can be an especially useful capability as you get more familiar with your chair and the results you get from different massages. And, while it doesn’t affect your body, the aesthetic appeal of your chair is important as well. When you compare massage chairs, the mind/body connection and how you feel when you see your chair should be a factor in your purchase decision. Finally, in order to ensure that your massage chair doesn’t become a source of stress, it should be backed by a strong guarantee. 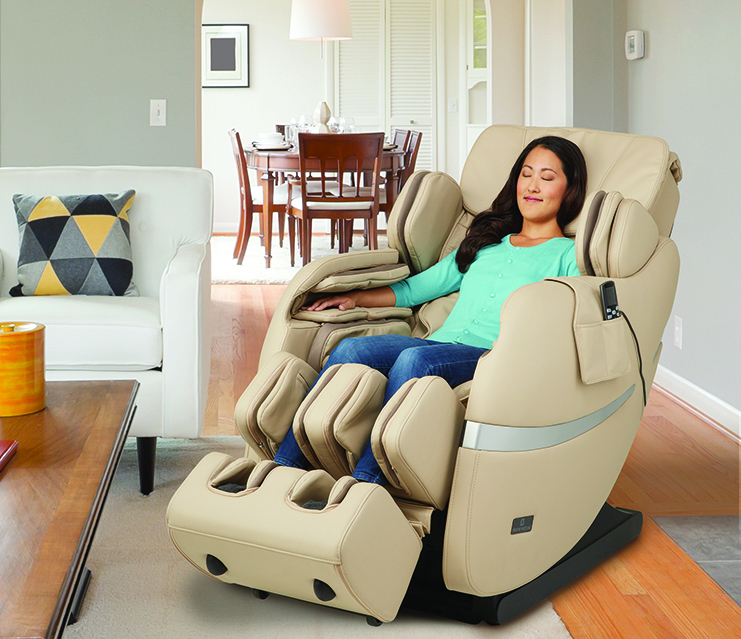 For example, you can try the Brio Massage Chair for 60 days in your home with what we call our “no risk happiness guarantee.” This means that if the chair doesn’t make you happier and more energetic by day 60, or doesn’t produce the stress reduction results you are looking for, we will pick it up for free from day 61 to 90. What happens to the body during a massage?